Tributes have been paid to Ribble Valley GP Dr Terry McCree. Born on May 25th, 1930, in Sunderland, Terry was the elder of twins who were born either side of midnight so he and his brother Mike celebrated their birthday on different days. Their father was a pharmacist, who had, at one time, dispensed for the Royal Family, and who died at a young age in 1948, leaving their mum Molly to bring up the twins and their younger brother Paddy on her own in their home at the foot of the famous Penshaw Monument near Tyne and Wear. During National Service Terry served as an RAF medical orderly, receiving his marksman’s certificate along the way. He went on to study medicine at Durham University. Meanwhile, his brothers Mike and Paddy, also entered medical professions as a dentist and pharmacist respectively. As a young doctor Terry met Marje, his wife-to-be, whilst out carol singing. He thought she was quiet, little knowing she actually had laryngitis at the time. They married in 1962 and Terry had a short stint at a practice in Lincoln, before the newlyweds moved to Slaidburn in February 1963 during the legendary blizzard. Terry would serve as the sole family doctor there until he retired due to ill health in 1993. Being the doctor in a rural community Terry saw many children born, including his three sons, Shaun, Paul and Jeremy, who he delivered at their home. Both he and Marje played an active part in village life, being founder members of the Bowland Forest Archers, which gave archery exhibitions at local events. The family moved to Waddington in 1976 when the new health centre was built in Slaidburn and Terry was able to join the St Helen’s Church choir there, a passion of his since childhood, and it was there that he later received his medal for being a church chorister for 50 years. In 1981 Terry went into hospital for what was thought to be a routine throat operation but which turned out to be a serious cancer that was in his brain. 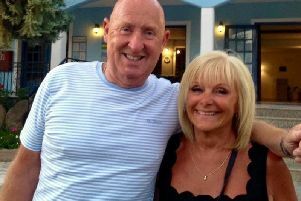 After a serious op and a period in intensive care, followed by radiation treatment, Terry was given, at the most, two years to live. It turned out they underestimated that by some 35 year! Terry had bouts of surgery for complications resulting from the treatment, including a radical new procedure which was videoed and became a training example for young surgeons. The big storm in 1984 saw a huge tree fall from Shay Wood right through the roof of Slaidburn health centre, causing serious damage. While that was being repaired Terry held his surgeries upstairs in the village pub, the Hark to Bounty, and there is still speculation whether patients preferred the hospitality of the pub to the surgery waiting room! During his time at Slaidburn health centre, Terry was also interviewed for a special episode of BBC Countryfile, focusing on the life of a country doctor, and he was often likened to Dr Finlay, dashing around the practice in his Harris Tweed jacket, his pockets rattling with the small pharmacy he carried at all times, ready to treat almost any ailment. The next few years saw the family travel around Europe and the USA to magicians’ competitions where Shaun was competing and Terry became the unofficial doctor to the acts. But when they visited Spain and he fell ill with salmonella poisoning it was Jeremy who got him through it enough to get him home safely. Eventually the various illnesses and operations took their toll and Terry retired from medicine in 1993 to enjoy listening to his beloved choral music and catch up on his reading. Recent years had seen his health decline and after Marje passed away in 2015, he was looked after by Paul and Jeremy to the end. Terry passed away peacefully on September 1st, leaving his three sons Shaun, Paul and Jeremy and his daughter-in-law Jackie, Shaun’s wife. His funeral will be held at Accrington Crematorium at 3pm on Monday, September 17th, and the family have asked for any donations in his memory to be made to the charity MacMillan Cancer Support.